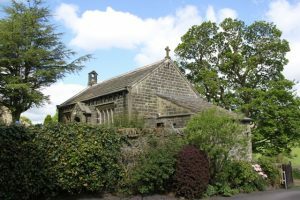 Stanbury’s St Gabriel’s Church has recently reached the final stages of a repair to their roof. This report brings you fully up to date with the details of the work undertaken. Protection of interior, and erection of scaffold. Remove and re-bed ridge and top slate courses, includ­ing continuous zinc strip to inhibit future moss growth. 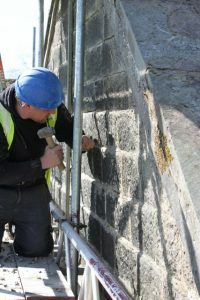 Remove coping stones to west gable, and sufficient slates to provide access for timber replacement. Open up masonry around all purlin ends for timber treat­ment. Splice repair to ridge beam with steel support. Replace slating battens and felt around stripped section and ridge, new supplementary first rafter, new flashings. New flashing and sleeve to bell rope where passing through slating. Lubricate moving parts, clean down and paint all the metal work around bell. Re-bed coping stones, west end, bedded on lead. Re-pointing, including gables in lime mortar. Insect mesh to existing louvres. New rainwater goods in PPC aluminium, with repair of the only remaining original cast iron gutter on the north elevation. The work on the project started on 24th April 2017 and was practically completed on 18th May 2017. The project has successfully carried out urgent repair works to the church roof and masonry. The contractor, Parochial Church Council (PCC) and architect worked well together throughout the contract, which completed a week early through a combination of good weather and efficient working by the contractor. The PCC and contractor worked with the neighbouring owner to ensure their satisfaction and allow scaffolding and access on their driveway. On the building the purlin ends were found to be in salvageable condition and were treated rather than splice repaired. The worst affected timber, the ridge beam, has been repaired. Some contingency was spent on essential re-pointing, and additional works were required at the ridge due to severely perished under-felt and requirement for new slates. No bats were discovered during the works. The most urgent element of the project was the replacement of the decayed timber ridge beam, which has been completed. The purlin ends in the west gable were examined and found to be salvageable, and were treated rather than cut out. The first rafter to the south was decayed and was supplemented with a new timber. The full ridge was removed and the roofing felt found to be in extremely poor, damp condition. 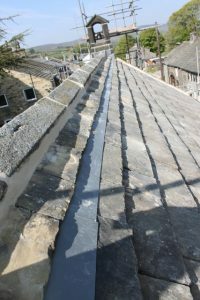 Breathable-felt was installed along the full ridge, with replacement of the majority of the top three rows of stone slates also necessary. The original ridge was re-bedded on NHL 5 Lime mortar. The final cross of the east gable was found to have movement, and was re-set and pointed. The bellcote was refurbished with new lead apex cover, re-pointing and refurbishment / lubrication of the bell workings. The original cast iron gutter on the north elevation was taken down and fully refurbished. The west end section was broken and a best match replacement section added in place. The original tender was to retain and supplement the existing brackets, however, these were found to be in a poor condition on close inspection and were not salvageable. New brackets were obtained. New powder coated ogee aluminium gutters and fall pipes were installed on the south elevation, the porch and the east lean to roof. New access gullies were installed at the base of the south down pipes, whilst others discharge to ground as per the pre-existing arrangement.